PILI, Camarines Sur—The Commission on Elections (Comelec) is set to proclaim Atty. Gabriel Ariel Abonal as a duly-elected member of the Sangguniang Panlalawigan of this province on Friday (February 20) following the poll body’s issuance of a writ of execution implementing its en banc resolution which cancelled the certificate of candidacy (COC) of Romulo Hernandez. It will be recalled that Hernandez’s COC for Board Member was struck down by the constitutional body for being violative of the three-term limit rule. In its writ of execution dated 12 February 2015, the Comelec en banc has directed the Special Provincial Board of Canvassers of the Second (2nd) District of Camarines Sur to convene on 20 February, 2015 at 10:00 a.m. at the Comelec Session Hall in Manila. Additionally, the Order commands the Special Board of Canvassers to proclaim Darius S. Nopra and Gabriel Ariel F. Abonal as the duly elected First and Second Member of the Sangguniang Panlalawigan of the 2nd District of Camarines Sur, respectively. Nopra garnered the second highest number of votes (54,024); while Abonal obtained the third highest number of votes (43,806) among the candidates for board member in the 2013 elections. Signed by Acting Chairman Christian Robert Lim for the Commission, the writ was issued at the instance of Abonal, who filed an Urgent Ex-Parte Motion for theIssuance of a Writ of Execution on February 10. The writ of execution stems from a Comelec Resolution docketed as SPA No. 13-149 and promulgated on January 30, 2015. Therein, the the poll body reversed earlier ruling of the Comelec Second Division dated July 8, 2013, which ruled in favor of Hernandez. It reasoned: “To allow Respondent to run for the same position would obviously defeat the very intent of the framers when they included the three-term limit rule,” said the decision. “While members of the provincial board are elected by district, membership in the provincial board should be considered as one local government post, within the purview of the three-term limit rule. The matter of apportioning the members of the provincial board among the districts is exclusively for the purpose of election to ensure that a legislative district is sufficiently represented so that the people can be effectively heard. It was never intended to create independent local government posts,” the decision stated. Comelec Chairman Sixto S. Brilliantes, Jr., and Commissioners Lucenito N. Tagle, Elias R. Yusoph, and Al A. Pareno all voted in favour of the cancellation of Hernandez’ COC. Meanwhile, Christian Robert S. Lim and Arthur D. Lim both dissented. Luie Tito F. Guia, who was on official business, did not cast his vote. 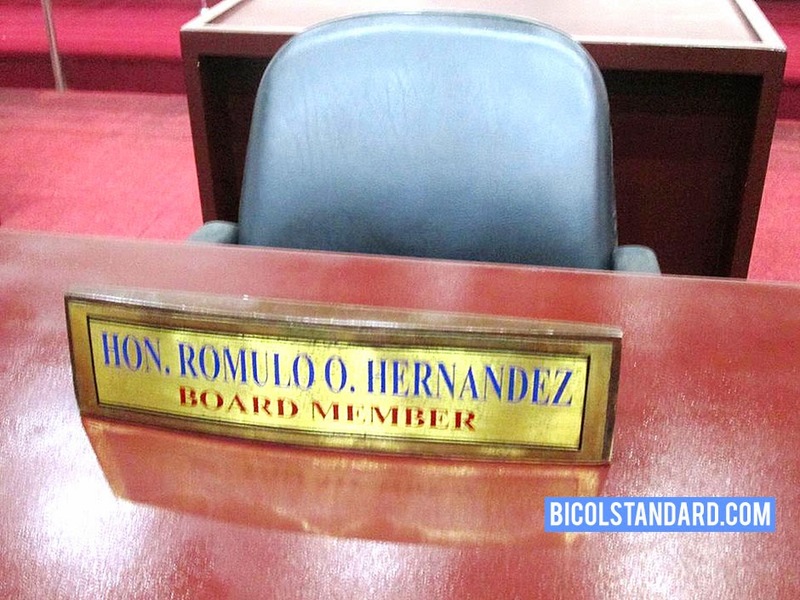 The soon-to-be- former board member was noticeably absent during the Tuesday’s regular session of the Sangguniang Panlalawigan.